President Obama announced a new American war this month, but it didn't resonate in his polling much, if at all. Overall, his poll numbers dropped, but the net result was rather flat. But the (so far) very slow nature of this new war may lead to Obama's numbers ticking up in the future. To put this slightly differently, Obama's poll numbers may very well reflect the direction of the war for the next few months (although the midterm election will also have a big influence). But before we look to the future, though, let's start with the new chart showing September's numbers. The biggest news of the month was our new war, but so far it is a pretty nebulous war in the public's mind. Consider the fact that nobody has even really come up with a name for the new conflict, and the media and the government can't even agree on which acronym we are fighting. Is it the ISIS War? The War Against ISIL? Or are we fighting the Islamic State? No common term has become standard, and we're already over a month into our bombing campaign. It's hard for the public to rally, when we can't even agree what we're rallying about. September had a lot of political news stories that were interesting, but that didn't really have much to do with Obama. Scotland voted down independence from the United Kingdom, for instance. Domestically, the media focused on the midterm congressional elections, and the public began to tune in to local campaigns (Kansas, in particular). Congress returned, and then promptly adjourned without holding a vote authorizing America's new war. Remind me again: what exactly do we pay these guys for? In any case, this just added to the vague nature of America entering our next foreign war. Attorney General Eric Holder announced his impending retirement, which did at least give the pundits something to talk about for a few days. Holder was (as always) excoriated on the right, but the reviews from the left on his tenure were a mixed bag: Holder did some things extremely well (according to progressives), and some things he completely dropped the ball on (or even made worse). Either way, it didn't affect presidential polling much. The news media spent the end of the month absolutely freaking out over big and scary medical news. How much big and scary medical news affects presidential job approval ratings (and in which direction) remains to be seen, though. For the month, Obama's average job approval rating dropped the tiniest bit (0.1 percent) to end up at 41.5 percent. The good news is that this is the smallest negative drop he's seen in three years, but the bad news is that this leaves him only another tenth of a percent away from his all-time lowest monthly approval number (41.4 percent, set in November of last year, right after the disastrous Obamacare website rollout). 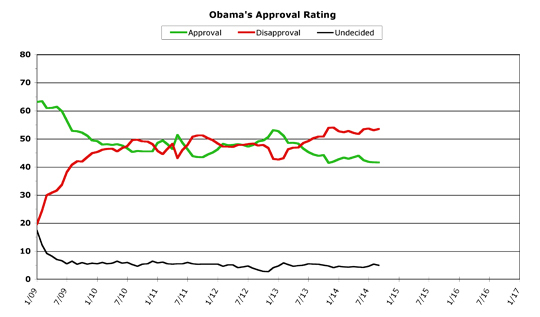 Obama's monthly average disapproval rating, however, has been much more active in the past few months. Last month, out of nowhere, Obama's disapproval rate fell 0.6 points, to 53.0 percent. This month, those gains were almost completely reversed as Obama's disapproval went up 0.5 points to 53.5 percent. This may have been due to statistical aberrations, where a few data points took on larger importance than they should have. The fact that Obama's approval rating held almost completely steady (losing 0.2 points and 0.1 points in the same period) means that the disapproval data swings in August and September have essentially cancelled each other out. This is another way of saying that for the past few months, Obama's numbers have been pretty flat, taken as a whole. It's impossible for me not to cheat a bit here, so I'm just going to go ahead and admit it up front. We are six days into a new month, and the October data is pretty startling, so I have to admit it's going to bias what I predict about future trends here. As I pointed out at the beginning of this article, Obama's fortunes may be closely tied to the Islamic State War's fortunes, for the foreseeable future (say, six months, at a guess). Of course the midterms are going to be in another month, with all the frenzied last-minute campaigning, and the election's results could put a cloud over Democrats in general (if they lose the Senate). On the other hand, if Harry Reid does manage to retain control, it could give Democrats a boost in energy. There will also be some big budget battles, both during the lame-duck period and again after the new Congress is sworn in (in January). President Obama has promised (once again) to take on immigration reform, this time single-handedly. Whatever he announces is going to have an impact in his poll numbers, that's a safe guess -- especially if he actually keeps his most recent promise and announces the change before Christmas. But underneath all of this, as a longer and more gradual trend, there is going to be the Islamic State War. How effective is our air-only campaign going to be? How effective are our partners on the ground going to become? Will the Islamic State be gradually rolled back, or will it be so complex a conflict that it'll be hard to tell who is "winning" at any given moment? If the air attacks go well, and if the ground forces we are supporting start retaking large chunks of territory (including major towns and cities), then the public is going to feel even better about supporting the war than they already do (public support, so far, has been pretty high for both the war and the way Obama has chosen to fight it -- Obama polled above 50 percent on the issue recently, which is notable since it is the only issue he's polled that high on in a long time). This is going to be a slow war, most likely. But if the news from the battlefield is positive (even if it is slow), it will likely provide an undercurrent for Obama's job approval polling. This trend may be too subtle to tease out, though -- it might appear more dramatically if the war goes bad and the public turns against it. Like any war, it is a gamble for the president. In September, Obama's daily job approval average once again stayed remarkably stable, only fluctuating 1.1 percent during the entire month (the same range as last month). He started fairly high (for this abbreviated range), and hit a monthly high of 42.3 percent one week in. From there, his numbers fell mid-month to a monthly low of 41.2 percent. By month's end, this had recovered to 41.9 percent, but with such a small range of fluctuation it's hard to tell any future trends. Obama's daily job disapproval rate moved much more dramatically (as it did last month, in the other direction), and fluctuated through a range of 2.5 percent. The first day of the month saw the lowest job disapproval rate, at 52.1 percent. By the tenth of the month, though, this had risen to 54.6 percent. At month's end, it was back down to 53.6 percent, for an overall monthly average of 53.5 percent). Both of these added up to an overall 0.6 negative turn for Obama's numbers. Disconcertingly, this pushed his "below water" number (job disapproval minus job approval) back up to 12.0 percent. For context, the worst he's ever charted in this category was 12.5 percent, last November, and this number had been as low as 7.7 percent back in May. But here's where I have to cheat a bit (spoiler alert!). Because while the aggregate numbers for September weren't very positive, there has been some solid and surprisingly large movement upwards for Obama's approval rating this month (as you can see on the RealClearPolitics.com page that provides our daily polling data). His approval rating now stands higher than it has in the last four months, and it appears to be heading even higher. This trend is reflected in the way his numbers have been rising steadily in most polls since he made his war announcement. His average daily number didn't reflect this until now, as some outlier polls with very low numbers had to cycle out of the data used to create the average. What this means is that this trend really probably is a bit more gradual than is happening now, but that it also started further back -- right after Obama made his war speech, in fact (which is why I spent time today discussing the war's possible future). Other things which may also be influencing this trend upwards could be (I'm just tossing these out there, it is too early to say for sure on any of these): the big and scary medical news (perhaps there is also a "rally 'round the president" effect during medical crises? ); the continuing good economic numbers (especially the unemployment number going below 6.0 percent); and/or more people paying attention to politics in general as the midterm election season heats up. Of course, there is not enough data yet to tell whether Obama can maintain this boost all month long (or even into next week), but this mini-trend is the most positive one Obama fans have seen in a long time. Whatever the reason, Obama could see some much-needed improvements in his job approval polling, right in the midst of the election campaign, if this trend continues. I have to admit that I am somewhat startled and confused by the RCP poll numbers..
Before commenting on the OPW numbers, I'll just note that the total lunar eclipse that occurred this morning (Eastern Time Zone) was SPECTACULAR! Skies were brilliantly clear and temperatures were comfortable. Totality occurred when the moon was just over just over the tree line, which made it look huge. It dipped to the trees just as dawn broke. Red moon, deep blue sky. I won't forget that soon. Back to topic. 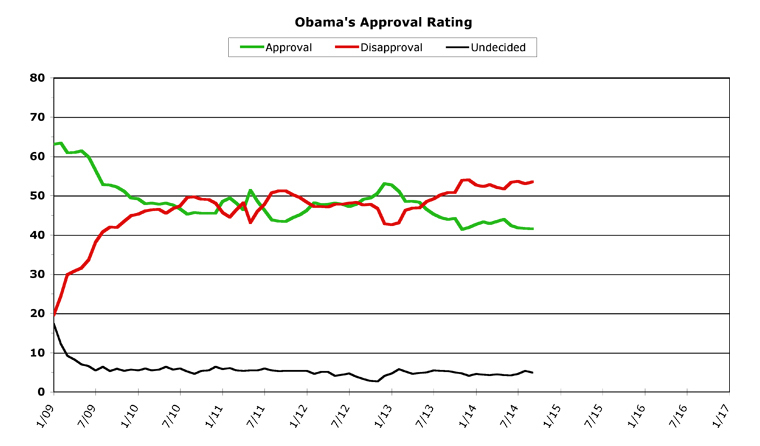 Obama's approval HAS shown a decent uptick in the first week of October. I think this is probably war driven, and reflects, in part, that Obama is having some success in forging a coalition of the willing. Still very much a work in progress, especially with regards a ground combat force, but some familiar names are signing on. Equally important, ISIL atrocities, ISIL is helpfully and even cheerfully document, are causing the US public wet their collective pants just a bit. Small digression here, but does anybody else suspect that the different videos featuring tall, slender, black clad, masked fighters marching down a street is in fact the same platoon being trotted about from locale to locale. I mean, I keep seeing what looks like the same guy, with the same long barrel sniper rifle held vertically in Every One! Shades of General John B. Magruder, Battle of Yorktown, Peninsular Campaign, US Civil War? "Stop scratchin' and get in the technicals guys, we've got 3 more locations to shoot before we lose the light!" This propaganda may prove two edged. Certainly if somebody goes to trial in international court. "This is going to be a slow war, most likely." I'd say most definitely. So far, events remind me of the first few weeks in the Libyan Campaign, when rebel held cities were under siege and civilians were pushed into smaller and smaller perimeters. Things turned around, but it took months. The latest campaign will go much longer. There is still a lot of talk about the need for an external ground combat force to support the external air campaign. Succumbing to this pressure is Obama's greatest approval risk, especially if they are US troops, and even if they aren't front line fighters. It's a vicious cycle that leads to quagmire, and the American Public instinctively and proactively gets it. How many quagmires does it take for a politician to learn the lesson? A lot apparently. Democrats pushing a large ground component are suckers/idiots, and Republican who are pushing it are suckers/idiots or will stop pushing it should they become the majority, because they recognize toxicity when see it. In my opinion, the fewer the non-locals, the better. The only way to defeat ISIL (and potential rebranded franchises) is with troops who remain in country country for decades, because that's where they live. Anybody else becomes an occupying force that eventually goes home. By alienating the locals, and by wearing out their political support back home by: spending public money, or by coming home in a box, or damaged, mentally or physically. That is the brutal and well proven calculus. There is also a lot of talk about training an opposition army. Forget about it, past the very basics of how to use the very basic equipment we give them. "This is a recoilless rifle. It will punch a hole in an urban strong point. The round goes here. It hits where you point it. Go try it." The rebel forces will never be western model soldiers, they can't be, they shouldn't be, they have evolved their own style of warfare suitable to culture, geography and economy. That doesn't mean they can't be very effective on their home turf. But, if they can't train themselves, then they can't sustain themselves. People learn best by doing. All said, I think there's a pretty solid ceiling on Obama's popularity number. Somewhere above 50%, but not much more, because he hasn't got much time left office to wrap things up, and no congress to help. If things go goes badly, the floor's the limit. Holy crap!!!! I just remembered!!!! Season 10 premiere of SUPERNATURAL is on!!!!!!! “The suggestion that individuals who have ties to ISIL have been apprehended at the Southwest border is categorically false, and not supported by any credible intelligence or the facts on the ground,” a DHS spokesman said in a statement today. You actually believe the Obama Administration??? Terrorists KNOW that our Southern Border is, for all intents and purposes, an Open Border..
And you can PROVE that, right??? But I do like how you can joke about Americans being killed by scumbag terrorists.. Blood moon happened too late for me, out here. Do you think the uptick is solely as a result of the war, or perhaps ebola (rally round in times of distress, either way, I guess)? I don't agree that the "floor's the limit" on Obama's poll numbers, though. So far, he's holding a floor of 40%, he hasn't fallen through that yet, really (unlike Bush, for instance). Lefties are just as patriotic as righties. We just want our wars to make sense, instead of pulling out of Tora Bora when OBL could have been caught, that's all. WWII -- Democratic president, the whole time. Aha! Someone else is paying attention! Yea?? They sure showed it after Vietnam, didn't they?? They sure showed it with General Betray-Us, eh?? Which of my facts do you find wanting?? Terrorists have threatened attacks on the US proper?? Middle East ties to Mexico?? Terrorists are aware of Obama's Open Border policies?? The results of Open Borders coupled with diseased immigrants being turned loose into the population without any health screenings at all..